Sorting out my old video collection the other day I can across a film that I used to love. It is a film about an American football team, the Titans, the film is aptly named ‘Remember the Titans’. It was a film about a sports team who worked to overcome racial intolerance; they were a mixture of white and black players in late 60’s. So what has this got to do with Cubs? At the end of last term the Cubs leaders decided a joint meeting would be a good idea. Something fun, something out of doors rain or sunshine, and something everyone could participate in? Not too much to consider remembering Staggs meet on a Tuesday and Wolves and Foxes on a Thursday. 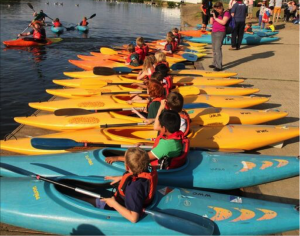 Kayaking at the waterside centre, sounds perfect but then the logistics started to fall apart, too many Cubs to have everyone kayaking at the same time on one day. 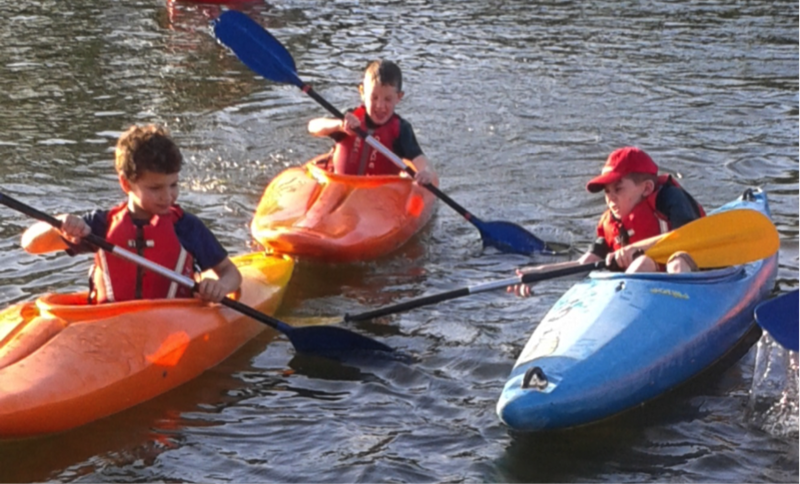 So on w/c 21st of June the Cubs descended on the waterside centre 24 Cubs on the Tuesday and 32 Cubs on the Thursday. 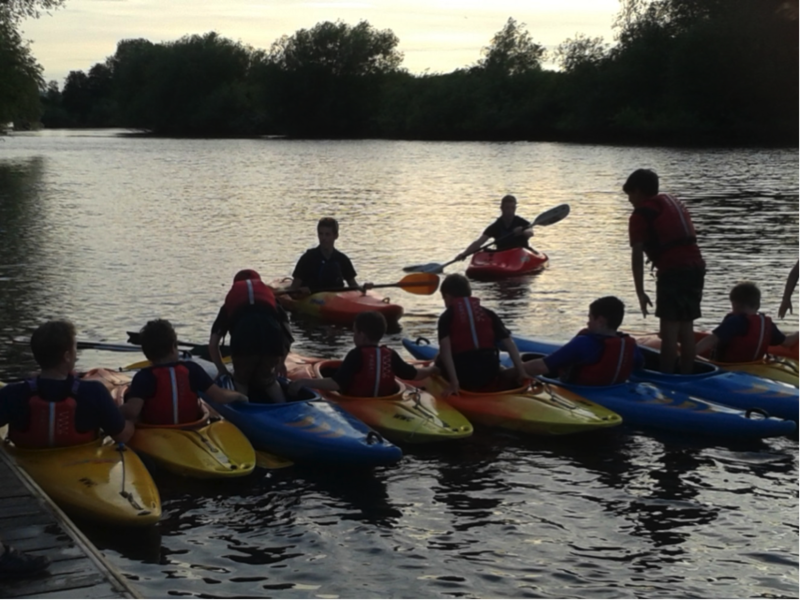 Once again 2nd Bracknell Cubs trip to the Wokingham waterside centre came with gorgeous weather and fantastic coaches. Though it did give Baloo a nightmare in group allocation and form collecting so a big ‘Thank you’ to him and all his effort and time to make the kayaking run smoothly. The Cubs had loads of fun, some came out of the kayaking looking like they had fallen in, some did fall in, and some stayed dry. So what has this got to do with an old American football team film? Just like in the film, sport united the Cubs; they had to work with Cubs they may not know, it taught tolerance, communication, fairness and helped enhance physical coordination and strength. It also united the Leaders and parents, working in a unit can sometime become insula, these joint meetings with a common activity are so important to the Cubs, Parents and Leaders alike. Win a £20 voucher by designing this year’s camp badge. Your badge design may be any shape, include up to four colours and one other colour for the background. On the reverse put your name, section (Beaver, Cub or Scout) and full group name, eg 2nd Bracknell. The winner will be announced at this year’s camp. Entries to be received by Tuesday 30th June 2015. Normally the Monday after a weekend away with Cubs I’m exhausted, still trying to sort out hastily packed boxes, cleaning kitchen equipment and sorting through various miscellaneous carrier bags of debris. Today though I have caught up with my household chores, spoken to parents, taken the dogs for a walk and had a very pleasant relaxing day. So why the difference? 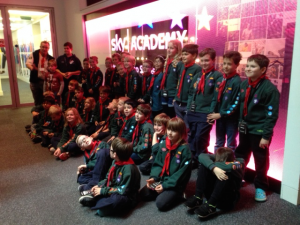 The Cubs went to PGL Liddington. PGL are a company that run activity centres, inspiring children with outdoor adventure. Most of the organisation of the holiday is done by PGL from an initial per person inclusive cost to being looked after for the whole weekend by our “Groupie” everything is organised for me. Last year when the Leaders at Foxes sat down with the Cubs to ask what sort or holiday or camp they wanted in the Cubs year of adventure they unanimously voted for beds indoors, with showers. They wanted lots of activities, cake to eat and they wanted to go by coach. Firstly, I found the costs for indoor accommodation and eight adventurous activities at two scout centres, I also spoke to PGL, the costs were comparable but with PGL all the bedding was supplied, food was included and I didn’t have to organise everything or spend the weekend cooking. We left Bracknell at 3pm on the Friday by coach, and arrived at Liddington at 4.15pm. We were met by our groupie Sami and were shown to our en-suite rooms. The Cubs were split into rooms of four, bunk beds, all beds were made and the kids enjoyed unpacking. Our Groupie gave us a tour of the site and went through the site rules and fire procedures. It was then time for our first meal, a choice of three dishes, choice of vegetables, salad bar, fruit and cheese cake. It made a huge difference sitting down and eating with the Cubs, talking to the Cubs, they were so excited. After tea it was time to play “Ambush” a wide game, first job was to put on camouflage, mmm rather them than me. The Cubs then spent hours running around the bushes thoroughly enjoying the evening sunshine. Soon it was time to go to bed; the Cubs sung their way back to the rooms and washed. Figure 1 Make up delight for the Friday night. The next morning the Cubs were up and ready by 7am for breakfast at 8am, after cereal, cooked breakfast, toast and fruit it was off to our first activities, Quad biking and crate challenge. Figure 2 How high can we go. Figure 3 This is hard work. Figure 4 Learning to belay. Figure 5 Can we stay up here? Figure 6 Girls are always the best drivers. Figure 7 Not too fast and don’t knock me down. Figure 8 do we really have to go up there? Figure 9 A new technique the caterpillar wiggle. Figure 10Figure 11 Come here I’ll help. Figure 12 I made it! Figure 13 Fire when ready. Figure 14 Can I touch? Figure 15 A new skill discovered. Figure 16 I wonder if I can get into bed without washing? Figure 17 Keeping up the Scouting traditions. Elemental movements. Saturday night saw everyone asleep by 9.30pm, wonderful. Sunday morning saw cooked breakfast with, apparently, the best spaghetti ever. This time it was off to zip wire and challenge course. After a lunch of hot sausage rolls we had just enough energy to try fencing and vertical challenge. Figure 22 Looks easy from here. Figure 23 because I’m happy, clap along, if you feel like that’s what you want to do. Figure 24 that really is high. Figure 25 Made it to the first bit. Figure 26 I think I want to come down. Figure 27 Yep too high. The trip home on the coach wasn’t as quiet as I expected, but I did enjoy the rendition of Reece’s peanut butter cup. The Cubs were challenged, encouraged, excited and all had a fantastic time. Now I wonder where they choose to go next? A big thank you to everyone who turned out for our first working party of the year. The outside of the hut was given a big spring tidy up, with leaves collected, grass strimmed and mown, over grown bushes and trees cut back, flower beds dug over and the fire pit area reorganised. Our maintenance expert also repaired the broken toilet. Ian Wooster, Ed Cecil, Alex Farrell, Sally Bangs, Klax, Colin Thorne, Jason Dale, Richard & George Creber. Watch this space and your email for details of the next working party.